Now, we are pleased to present the winning essay from Christian H. Heller of the United States Marine Corps’ Expeditionary Warfare School. In 2018 Israel celebrated its seventieth anniversary, marking a history beset by both controversy and triumph. Researchers grapple with the truth of 1948. The historian Avi Shlaim diagnoses the argument to be between traditional narratives of the miraculous Jewish victory against impossible odds and the re-written history based on archival evidence driven by the so-called new historians. He writes, “There can be no agreement on what actually happened in 1948; each side subscribes to a different version of events.” These competing sides search for truth on subjects such as the flight or expulsion of Palestinians, the sheer mass or disunity of Arab armies, and the British support or indifference towards the Jordanian invasion. Entire libraries dedicate their existence to these questions and the enormous amount of ongoing research precludes a full review here. What is beyond doubt, however, is that the nascent Israeli state won an authoritative military victory which laid the groundwork for its success in future wars of survival. Israel’s national strategy in 1948 revolved around mitigating three strategic deficits. First, the Yishuv—or Jewish community in Palestine—lacked a professional military capable of defending its sovereignty against the Arab armies. Second, despite rapid immigration after World War II (WWII), Israel’s population was a fraction of the size of its combined Arab opponents. Finally, the dispersion of the Jewish community, its extended borders based on the United Nations’ (U.N.) partition, and Israel’s lack of geographic space in which to maneuver its forces minimized its military options. Israel’s ability to build and employ an army, divide its enemies to exploit their weaknesses, and create artificial space in which to operate demonstrates how to overcome strategic deficits and attain victory with strong military institutions and a cohesive national strategy. The Zionist movement began at the end of the 19th century to merge the world’s scattered Jewish communities into a unified political entity. Zionists based in Palestine worked within the British Mandate system to turn it to their advantage while Arab elites opposed the Mandate and the Balfour Declaration’s promise of “the establishment in Palestine of a national home for the Jewish people.” Arab leaders rejected any possibility of an independent state for a Jewish community that in 1930 only made up 17.8% of the Palestinian population. British authorities attempted to placate Arab concerns about Jewish immigration on multiple occasions, notably including a visit from Winston Churchill, then the Colonial Secretary, who traveled to Jerusalem to reassure the Arabs a Jewish state would never be formed in Palestine. Arab opposition grew even further when the Palestinian economy crumbled during the Great Depression and due to industrial strikes against the British authorities as well as the the 1936-1939 Arab Revolt. The revolt began in response to the 1937 Peel Commission which favored Jewish aspirations, reporting that Jewish civil services and infrastructure had a “general fructifying effect” in the region and that Jewish land acquisition was fair and useful. It also recognized the “irrepressible conflict” between Arabs and Jews and declared that the Mandate in Palestine would fail. Besides the nakba, the Palestinian mass exodus following the 1948 war, the Arab Revolt is remembered as “the most traumatic event in modern history for the Palestinians.” Britain responded with a ruthless counterinsurgency campaign including mass arrests, collective punishments, and the destruction of Palestinian homes. The revolt only ended due to interference from external Arab leaders, and many Palestinian leaders were exiled or fled which left the local Arab population without guidance. One such leader was Haj Amin el-Husseini, the Grand Mufti of Jerusalem, who fled for fear of arrest after encouraging the Arabs to revolt. The Grand Mufti drew close to Nazi leaders during the 1930s and 1940s and used those contacts to obtain money, weapons, and anti-Jewish propaganda which hurt the Palestinian cause in the eyes of the international community. The 1939 White Paper rejected the partition of Palestine and limited immigration but still promised a Jewish national home. Both the Zionists and the Arabs rejected the decision, but further discussion was suspended when Jewish leaders decided to support British efforts in World War II. After the war, American support for a Jewish state in Palestine counterbalanced the views of an insolvent Britain who advised against it. Regardless, Britain was bankrupt and shedding its colonial holdings. In February 1947, they passed the Palestine issue to the U.N., which voted for partition but provided no guidance or funding for the new countries. The U.N. decided two states should be created, and London—resolved to depart as soon as possible—set a date for withdrawal hoping the opposing sides would cooperate to form a functioning government. Their hopes did not pan out, and sporadic violence in 1947 turned into a full-blown civil war. The Palestinian Arabs had no trained military forces; the local militias had no weapons suppliers; and the population was without leadership. Arabs in Palestine had “a weak and fragmented tradition of independent political organization” with no comparable organization to the Zionist Commission. Despite sharing the same language, religion, and history, “deep internal divisions” divided the Palestinian factions. In contrast, the Yishuv was united politically, motivated to fight, and led by “centralized para-state institutions” in 1947. It relied on “strong communal institutions” for organization, the most important of which was its militias. Jewish war preparations began two decades earlier, when the Haganah, its largest militia, crafted national defense plans in response to inter-communal violence. Jewish leaders spent the ensuing ten years traveling the world to gather support, and a 1943 charter called for all Jews aged 17 and older to serve for two years. The army did not exist yet, so conscripts were encouraged to enlist into the “Service of the Nation.” Many Haganah members departed for the battlefields of World War II, and a subset named the Palmach was organized to defend the Yishuv. The unit established itself as an elite force due to its group cohesion, heavy weapons expertise, and proficiency in small-unit tactics. Yishuv leaders assessed that Israel’s outlook against the Arabs was grim. The Jewish population was half that of the Palestinian Arabs and only 3% of the total population of the Arab states. The Jews were dispersed and geographically encircled by Arabs who controlled most of the hills and major roadways. U.S. intelligence reported in 1947, “Unless they are able to obtain significant outside aid…the Jews will be able to hold out no longer than two years.” The new state’s first step toward changing this outcome was to form a professional army. The creation of the Israeli Defense Force (IDF) as a professional army may be one of the most impressive wartime mobilizations in history, so much so that on 14 May David Ben-Gurion, Israel’s first Prime Minister, wrote in his diary, “At four in the afternoon the Jewish independence was proclaimed and the state was established….Its fate is in the hands of the armed forces.” Ben-Gurion’s primary objective as a leader was the professionalization of a centrally-commanded, well-organized national army capable of defending against the Arab militaries. Between 1947 and 1948, the Haganah underwent major structural reforms to incorporate various militias and become a professional fighting force, growing to comprise 12,000 infantry and 20,000 reserves. On the other hand, it possessed only one gun for every three soldiers and had serious shortfalls of heavy weapons, armored vehicles, and artillery. Both the Irgun and Stern Gang counted about 3,000 fighters in their ranks. The call went out after independence for 30,000 additional reservists and foreign volunteers to join the Israeli Defense Force. Fortunately, the Yishuv was a good starting point for an army, as many Palestinian Jews trained under the British during the Second World War. Amongst the new Israeli Defense Force’s 2,250 officers, approximately 800 had professional British military training. The Haganah consisted of three separate entities prior to restructuring: the Palmarch, the Field Force, and the Guard Force. Both the Field and Guard Forces lacked centralized commands, fought only as small individual units, and relied on local financing and leadership. This focus on local responsibilities meant higher command had little authority and would be unable to move reinforcements as the war dictated. Adding to the Haganah’s command problems was the political body of Zionist representatives who led it. 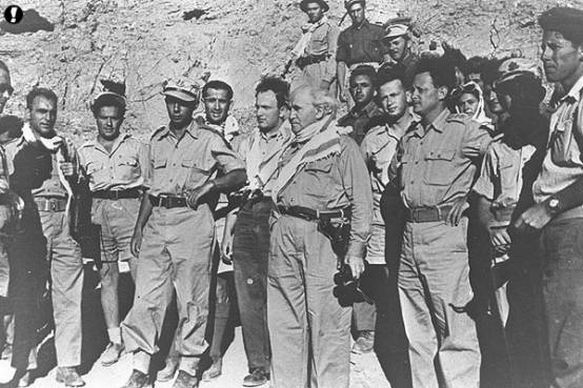 Ben-Gurion streamlined the command structure with himself and a security committee at the top and converted the Field Force into a regular military with its standard unit being the brigade. Five regional commands were established for operational control. The three existing Palmach brigades remained distinct groups but their leaders were incorporated into the Haganah. Of the Israeli Defense Force’s 14 initial brigade commanders, only four had professional training and experience from World War II. Differences between the British-trained officers and the local Haganah officers led initially to deep rivalries, and the young military lacked staff officers, discipline, training, and experience. Ben-Gurion and senior leaders focused on combining the Haganah’s respect for achievement (and accompanying lack of discipline) with the professional training and strict standards of veterans of the Second World War to form a functioning military. The possibility for co-existence or negotiations with the Arabs seemed remote after Arab leaders made blatant declarations about their intentions to destroy Israel. Azzam Pasha, Secretary-General of the Arab League, proclaimed, “This will be a war of extermination, a momentous massacre.” Hassan al-Banna, leader of the Muslim Brotherhood, stated, “All Arabs shall arise and annihilate the Jews. We shall fill the sea with their corpses.” The initial date of invasion remained a surprise, but public statements, domestic violence, and the overwhelming military balance in favor of the Arabs created a sense of urgency in Israel. Its leaders exploited growing societal differences to “generate qualitative military superiority on the battlefield.” With a unified community and a proper army, Israeli leaders next turned their efforts towards diplomacy. Israel’s second strategic deficit was the population imbalance with its five Arab neighbors, with the approximately 600,000 Jews in Israel facing a potential opposition of 40 million Arabs. Since both sides lacked advanced machinery such as tanks and neither could conduct large-scale combined arms operations, population size was a good indicator of possible outcomes. The Arab states recognized this advantage and planned for a war of attrition. The civil war inflicted further blows to Israel’s manpower, and by March 1948, both the Negev and Jerusalem were in “virtual isolation.” By April, 875 members of the Yishuv were dead and another 1,800 wounded, an enormous toll for a small population. Israel needed to create artificial mass by driving a wedge between the Arabs states. The apparent disparities between the still-forming, casualty-stricken Israeli Defense Force and its potential enemies were stark. Egypt’s 45,000-man army appeared capable, well-equipped, and was trained by the British. The Iraqi army was similar in size and “better equipped, organized and trained.” Jordan’s British-led army, the Arab Legion, was Israel’s most threatening opponent. It was the Middle East’s sole “professional Western style force” with adequate leadership, equipment, and organization to carry out large-scale combat operations. Israel’s main target for diplomacy was Jordan. Through extensive communications between King Abdullah in Jordan and Jewish leaders such as Gold Meir, Israel confirmed its belief that the Arab efforts were fragmented. Arab forces suffered from an absence of coordination, a lack of a unified command and control, and competing strategic goals. Jordan wanted to control the West Bank, Egypt wanted control of southern Palestine, and Syria and Lebanon planned to dominate the north. Israel’s understanding with Jordan was their greatest diplomatic victory. Jordan tacitly agreed to avoid fighting Israel, and, in return, Israel would not oppose occupation of the West Bank by Jordanian forces. It appears local British authorities tacitly approved of the arrangement. The effects of the arrangement were dramatic, and the Israeli Defense Force outnumbered the Arabs during each phase of the war. None of the Arab states were willing to commit their resources fully to the destruction of Israel, and ultimately no more than 150,000 soldiers, the majority of whom were Israeli, entered the war despite the involvement of five armies. Most Arab authors who have written about the war credited Israel’s victory to confusion between Arab parties and Jordanian collusion. Israel’s final strategic effort required the creation of artificial space. The young Israeli Defense Force would suffice to carry out a decent plan against divided opponents, but it needed physical space in which to maneuver. Israeli strategic flexibility has always suffered from its small geographic size and an “absence of strategic depth [in which] space cannot be traded for time.” In 1948, Israel had a vast external border due to outlying settlements, with the Yishuv containing 33 settlements in Arab territory as well as isolated Jewish pockets in Jerusalem that could only be reached via the Tel-Aviv highway. Israeli planners believed the Arabs intended to cut off communication between communities and splinter the Yishuv. This isolation would prevent a unified Jewish defense against their invasion. The Yishuv debated two options: to occupy positions along the main roads and within outlying Jewish pockets to defend every community, or to vacate distant Jewish settlements and mass the population for ease of defense. Jewish leaders quickly decided the Yishuv would fight for all the territory allocated to it by the U.N., a decision based on potential political consequences. They calculated invading Arab armies could annex territory and pick apart the promised Jewish territories if they were left undefended. If any settlement was lost—forcefully captured or voluntarily abandoned—later negotiations would be hindered, and the idea of a cohesive Jewish nation would be lost. The Israeli Defense Force had three goals. First, they strove to control the main communication routes between Jewish communities in Arab territory to defend the settlements. The road connecting Tel-Aviv and Jerusalem became a main battlefield on which Israel suffered more casualties than in any other operation during the war. Second, to create artificial strategic depth by using fortifications and planned defenses in the outlying villages. Though costly in terms of weapons and casualties, this provided time for the Israeli Defense force to “consolidate, plan, and launch operations.” The results can be seen in the case of Egypt attacking to the north and Israeli forces massed in Tel Aviv. Finally, the Israeli Defense Forces had to quickly transition to the offense and take the fight into Arab territory to create additional space for military maneuvers. The planning paid off handsomely. The Arab armies, each in pursuit of its own objectives, allowed Israel to apply its limited manpower along the most important approaches. The Syrian and Lebanese armies barely advanced into Israel in the north due to strong Jewish territorial defenses. Jordan invaded the West Bank but limited most of its fighting to control Jerusalem. Costly fighting by the Israeli Defense Force pushed back Iraqi advances in the east, and Israel’s main fight came with the Egyptian army in the south. The re-organized Israeli Defense Force, along with its streamlined command structure, focused its efforts when and where they were needed. Their competence and flexibility to fight, maneuver, and counterattack between the various theaters ensured Israel’s survival until the first ceasefire in June. Israel used the two ceasefires to re-supply, relocate units, and launch surprise attacks to consolidate gains. Both the Arabs and Israelis required new supplies and reorganization after two months of intense fighting. New troops flowed into combat, and the total number of soldiers increased from 60,000 to 100,000, while Israel bolstered its capabilities with foreign-bought tanks, artillery, and aircraft. An American and British arms embargo remained in place for all of Palestine, but Yishuv representatives signed contracts with Czechoslovakia to obtain new weapons and ammunition. The Israeli Defense Force further streamlined its command structure by establishing communication directly between Tel-Aviv and the front-line commanders. The Arab armies operated independently during the truce as each state planned to consolidate their limited gains. They also failed to adequately resupply and prepare for the next round of fighting. The levels of external support provided to each side made it apparent the Palestinian cause had not received the “arms, funds or effective international diplomatic support” it needed to compete on the same level as the Israelis. The Israelis then launched a preemptive attack on July 8th after learning the Arabs intended to keep fighting. Offenses against Egypt in the south and Jordan in the east achieved great success, and Jewish territorial gains in only ten days included over 1,000 square kilometers of land and control over West Jerusalem. The international community quickly demanded a second truce, which lasted almost three months. The Israeli Defense Force preemptively launched their largest offensive yet when news became public that the U.N. was considering re-writing the partition resolution to reflect military realities on the ground. This meant Jewish control of the Galilee would be exchanged for Arab control of the Negev, which Israeli leaders could never accept. Four Jewish brigades and supporting assets attacked south against Egypt to capture the Negev and eliminate the possibility of a disadvantageous land exchange. The Israeli Defense Force trapped 4,000 Egyptian soldiers in the Faluja Pocket, where they held out for months until the 1949 ceasefire. Israeli advances in Galilee also secured the north from the Arab Liberation Army and Syria before the U.N. demanded another ceasefire that Israel refused. Fighting finally ended in January 1949 when Egypt announced it would negotiate a ceasefire to save its army. Israeli leaders learned from the experience of 1948 and formed four principles for their national defense strategy. First was the rapid penetration of enemy forces. Defensive operations to preserve the status quo were “judged either impossible or too risky.” Israeli Defense Force leaders realized preemptive strikes and rapid counter-attacks could achieve the dual purposes of removing immediate threats from the domestic population while increasing the threat to the enemy. Second, Israel needed to destroy major portions of its rivals’ military assets to help maintain Israeli superiority in arms as there would be no time to build up equipment once the next conflict broke out. Third, the potential exchange of the Galilee for the Negev showed seized territory could be used to advantage at the negotiation table. Finally, Israel understood the important role the international community played in its survival as well as the role it played in controlling ceasefires and negotiations. Future wars must be swift and achieve reasonable gains before the intervention of outside powers limited Israeli options. The battle-worn Jewish nation began immediate preparations in 1949 for the next round of fighting. The success of the Israeli Defense Force as an homogenizing agent meant it would remain the “bottleneck through which almost all Israeli citizens” would pass. Israel finalized its military reorganization by structuring the force on the Swiss three-tier army model consisting of a standing army of conscripts, a mass of reserves to mobilize in war, and a cohort of permanent military leaders and intelligence services to provide early warnings. At great expense to the young state, Israel held three large-scale mobilization exercises in 1950 and 1951 to ensure the system worked. Israel’s success in overcoming its imbalances in 1948 provides important lessons for the development of national strategy. Israel’s victory demonstrates how capable leadership can unite competing interests to create a professional military in a short period of time, how diplomatic and military efforts can complement each other, and how military principles such as mass and space can be manipulated. The 1948 war also helps the observer understand Israel’s strategic thinking in later conflicts and highlights the importance and possibilities of military organizational reform. Out of various scattered militias and immigrant communities, Israel created a professional military capable of fighting multiple foreign armies. From a population outnumbered 1 to 67, it created localized mass by deploying larger forces against weaker, divided enemies. Finally, in an indefensible geographic territory, Israel created artificial space through excellent planning, offensive aggression, and an unwillingness to retreat at great expense to its population. Israel’s ability to overcome its three strategic deficits led to its survival and recognition as a nation. Its victory was no “miracle”, but a “reflection of the underlying Arab-Israeli military balance.” Through analysis and preparation, Israel shifted a seemingly impossible military balance in its favor to earn its independence. Christian Heller is a graduate of the United States Naval Academy and holds a Masters of Philosophy in Modern Middle Eastern Studies from the University of Oxford. He is currently serving in the United States Marine Corps as an intelligence officer and Middle East/North Africa Regional Affairs officer. The views expressed are the author’s alone and do not reflect the official position of the U.S. Marine Corps, the Department of Defense, or the U.S. Government.